Cyotherapy, also known as cold therapy, is a highly effective way to treat the pain and swelling associated with orthopedic trauma and surgery. Cold therapy not only alleviates pain, but in some instances it can accelerate the healing process all-together. It does this by decreasing fluid buildup thus reducing swelling in the injured areas. (Swelling hinders recovery and increases localized pain.) In addition, cold therapy slows the release of the chemicals that trigger pain and inflammation, while also limiting the muscle’s ability to contract, thus reducing spasms. While there are many benefits to the proper use of cold therapy, cold therapy can also cause harm if administered incorrectly. 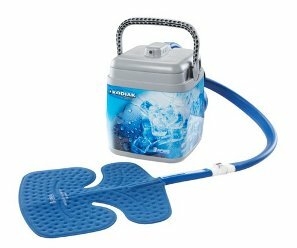 Cold therapy systems are most frequently used following orthopedic surgery. The system is similar to an ice chest in appearance. It utilizes tubes and pads to circulate cold water that chill the affected body part. These devices are typically recommended by surgeons and physical therapist to their patients, who then use these systems in the privacy of their homes. In some stances, a physician or therapist may not provide clear instructions. In others, a patient does not follow instructions precisely. No matter the reason, using a cold therapy system incorrectly can lead to serious injuries. Most if not all cold therapy injuries revolve around the leaving the system on for extended periods of time, thus resulting in a frost-bite like condition which can result permanent nerve damage and skin issues. If you are using a cold therapy system, carefully follow your physician’s instructions… when in doubt, limit the duration of use to ten minutes at a time. Many cold therapy systems do not feature a built-in “kill switch” that shuts the system down after a certain amount of time. If you are concerned that you may forget about the contraption or accidentally leave it on too long, consider the Breg’s 300 or Polar Care Kodiak systems. These top-of-the-line cold therapy systems feature built in timers to ensure you are never exposed to cold for too long and they also come with a variety of pads for the knee, ankle/foot, back and shoulder. If you receive a cold therapy system, it is vital that your doctor discuss proper use of the device, including cold therapy time intervals. If you have developed any unusual systems following cold therapy, be sure to contact your physician immediately. About MMAR Medical Group: MMAR Medical Group Inc. is a supplier of orthopedic medical products including a wide selection of diabetic shoes, hot and cold therapy systems, as well as back braces and supports. For quality braces including cervical collars, please visit www.mmarmedical.com.